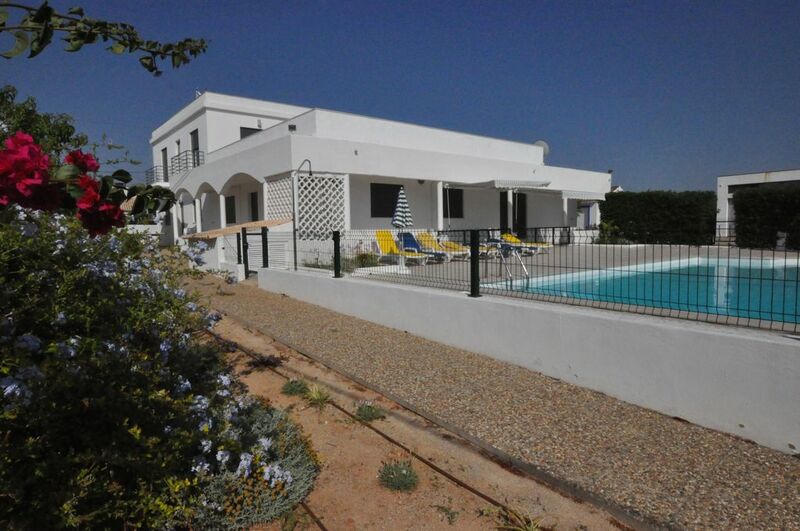 The house is situated in a private orange grove near the historic town of Silves. The location makes it easy to reach the beaches and the most important places of the Algarve.The house benefits from a large pool and various gardens: There is a children playground, exterior games and a fitness room with many elements. Great house for large families. Had everything we needed. Great pool (could do with a few more sunbeds to cater for size of property). Location was good - could walk into Silves. Bedrooms were fine (some damp in one of the bedrooms by pool). House was a great size. Overall, would recommend. 8 adults and 7 children, plenty of space/bedrooms. Great location as 10 minute walk into Silves-lovely historical town, with an amazing castle. Swimming pool is a great size, we used it every day! Lovely balcony -upstairs, overlooking the castle lit up at night. Would recommend the villa for large family holiday. Only downside - the umbrellas/ sunshades are looking tired/worn. Few bits and pieces need updating. Some door handles also need attention! Eduardo was always on hand to sort anything out. We had a fantastic holiday here! Eduardo himself was lovely and very kind. He brought us some local custard tarts and gave some of our party a lift to town which was very kind. The location to town is good but it is on a main road. Silves is a wond Raul town. I wouldn’t stay again purely because of the pool. It is my kids holiday too and they love swimming so I always stay somewhere that the pool can be heated. We never got full access to the property until 6pm due to a mess left by the previous group (they should consider taking a deposit to prevent this happening in the future). Villa pictures are old and they do not reflect the current condition of everything which is tired and worn. There was no canopy cover, table or chairs on the balcony as shown in pictures (I was looking forward to for the evenings but we could not use this space at all). The fitness room and games equipment. All cramped into one garage. To top this off we could not use the pool much in the second half of the week due to falling ash from nearby forest fires. I have rented properties abroad and at home and never had a need to review. This could be a lovely place to stay in but needs a little tlc. I am sorry that due to the exceptional circumstances of big fires in the vicinity things were not as they usually are, but we tried it the best we could cleaning the pool everyday but the ashes kept falling down. Our maintance personnel had to attend urgent matters but we fixed as soon as possible what was most urgent; some of the problems pointed out almost immediately. Actually everything is back to normal and we replaced whatever had problems, especially the outside equipment that suffer quite a lot during the summer season. The upper terrace was not as it should be because of warnings due to the possibility of fires. Now it is there. The pictures are from 2017. We have portable air conditioning equipment at the disposal of the clients that just need to ask for it. spacious, well kept, well equipped villa. unexpected gift from owner - delicious meal for all our party including my birthday cake and candles!